Did you know museums keep colonies of beetles to eat the flesh from bones for display? Or that Santa Claus had a broken nose? Have a squiz at skeletons and discover how experts find clues to murder in dry bones, why we can’t wag our tails and how a person’s face can be reconstructed from clues on the skull. Where did the idea for It’s True! 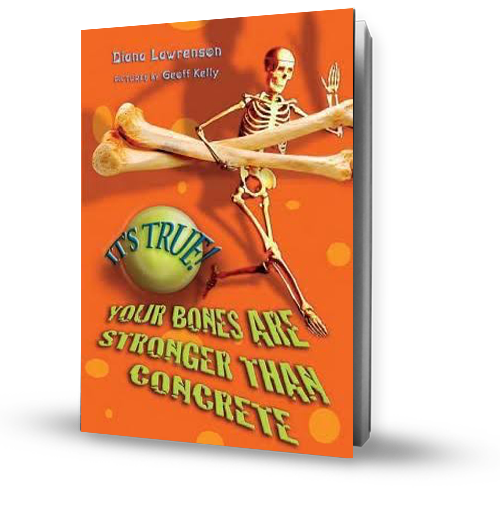 Your Bones are Stronger than Concrete come from? Everything about the human body has always fascinated me. Bones had endless possibilities from murder to music to language, besides the obvious science. Great fun!